This post is all about friend care package ideas. Care packages are an easy way to show your friend that you are thinking of them. Whether they are going through an exciting life event or need a pick-me-up, a friend care package will show them they have been on your mind and you care about them. It can be hard to decide what exactly you are going to send in your friend care packages. 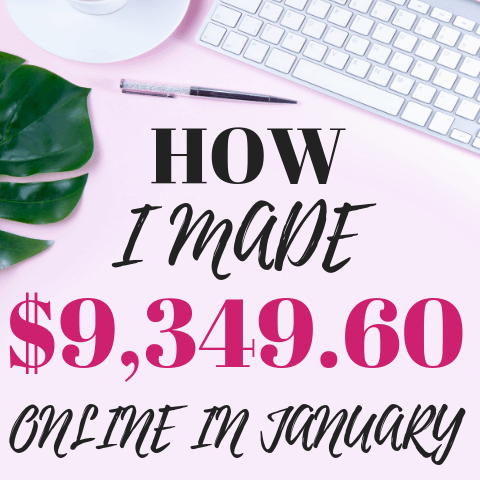 Are you going to DIY it? Buy some things on Amazon? Send a themed box? 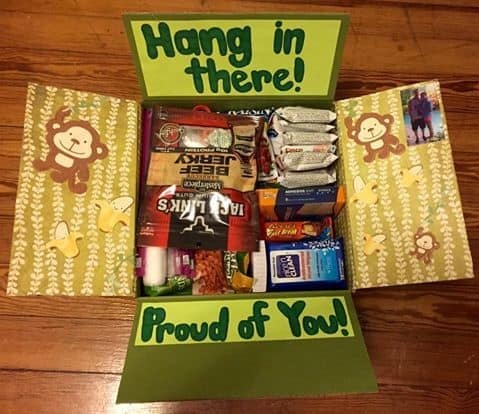 This post shows you 22 friend care package ideas that will give you some inspiration to create a care package of your own. If your best friend lives in another state than you, this is a perfect friend care package idea for you. All you need is some cute craft paper and you can create a similar look. Throw in some cozy items like these fuzzy socks, a cute graphic t-shirt, and snacks and you are good to go! This frame is such a sweet reminder that distance means nothing between close friends. This is the perfect idea to send as a long distance best friend care package. Plus, it is less than $20! Chelsea from Sunny With a Chance of Sprinkles shows you how to make a super cute best friend care package that will inspire whoever you are sending this too. 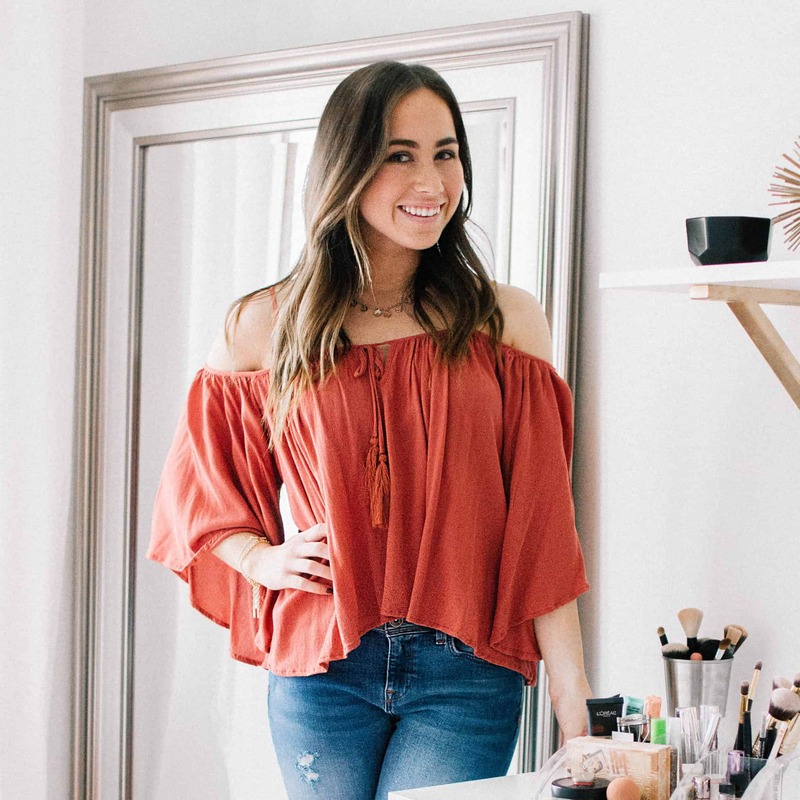 It will truly make your BFF feel so special and loved! Do you and your best friend love wine? If so, these are the perfect gift to put in a friend care package for her! These wine glasses are custom made to include the states that you and your friend live apart from each other. 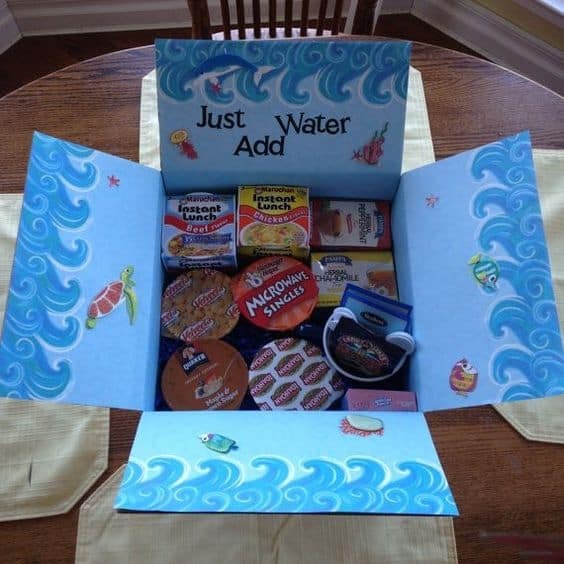 How fun is this care package idea?! Unfortunately, there is not a link to this direct tutorial, but this Pinterest image will give you a similar idea. 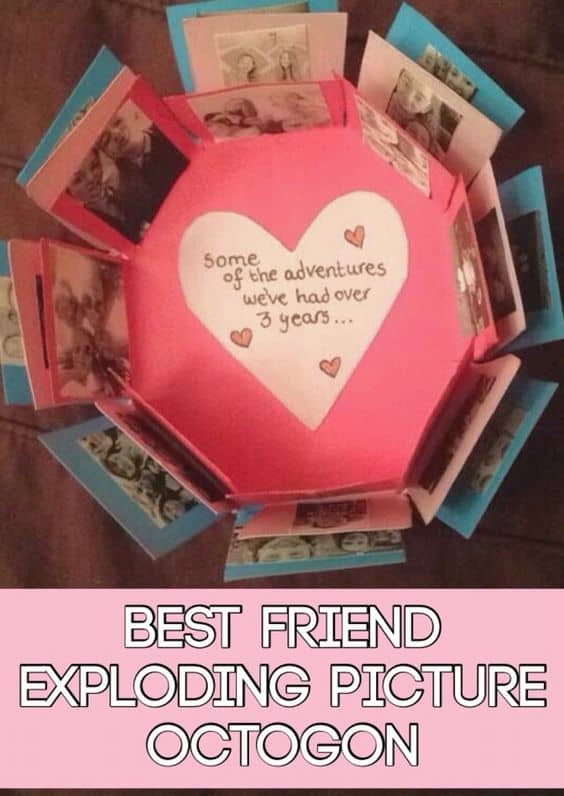 Your best friend will so love receiving this! Um, can I have this care package sent to me?! 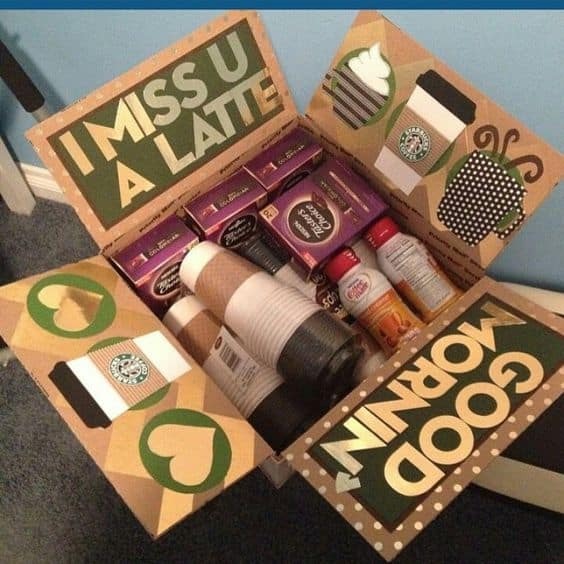 Any coffee lovin' best friend would LOVE to receive a box like this! Your dorm would be highly talked about if you went with recreating this Christmas dorm door! How sweet is this friend birthday care package? 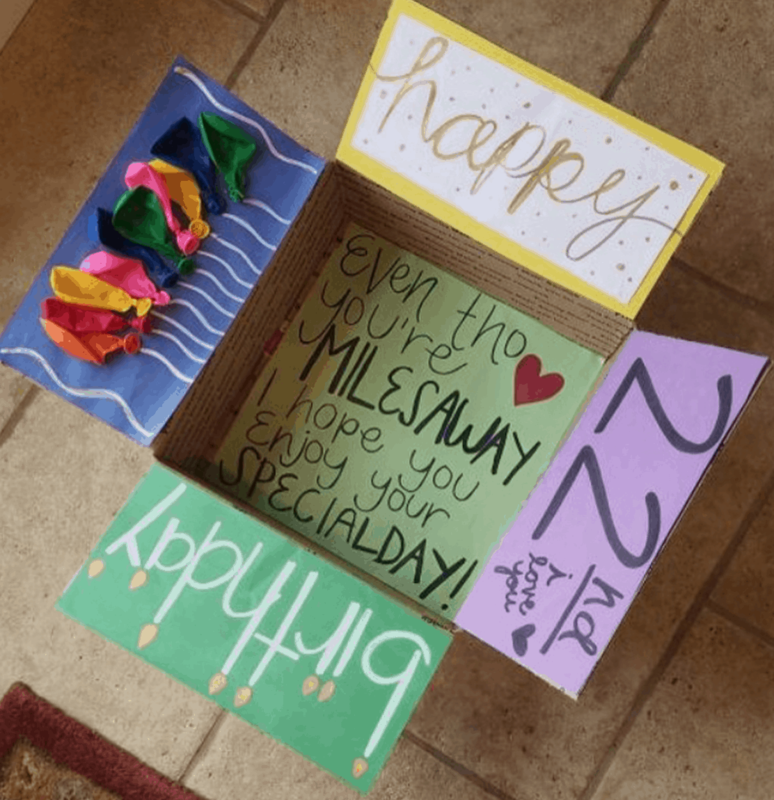 This care package idea really wouldn't take too long to put together with just some construction paper, markets, and balloons. Add some of their favorite treats and you are good to go! Last but not least, a gingerbread house college Christmas door decorations! This took a lot of creativity to come up with but it turned out so good. Are you looking for sick friend care package ideas? 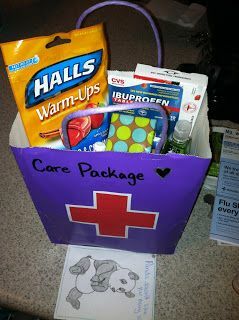 This shows you the best care packages to send one of your friends while they are sick. Nothing is fun when you're sick but this may put a smile to their face! 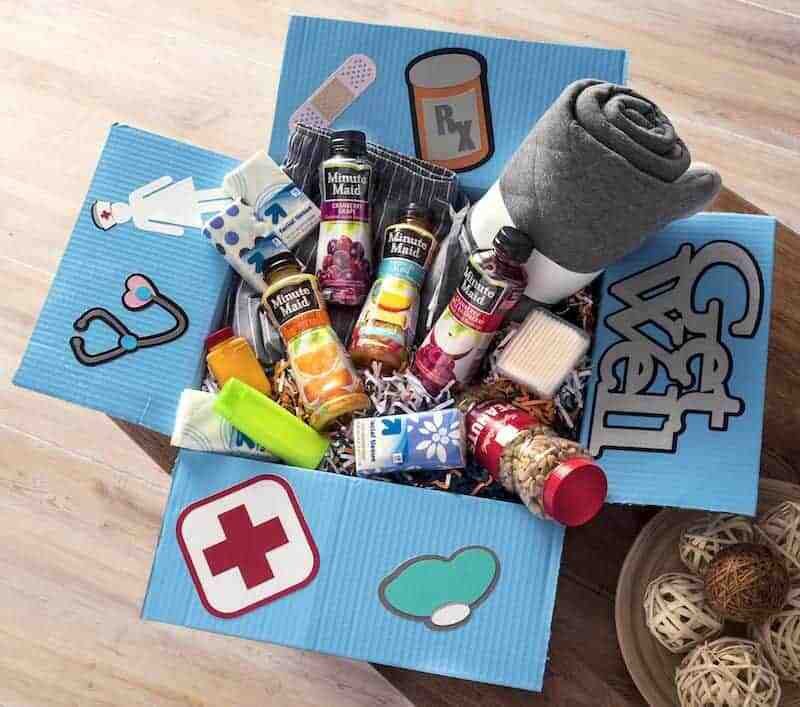 This sick friend care package idea gives them all the necessities to fight off the illness that they have. No one wants to go the store while they're sick so sending them in a care package will allow them to sit back and just rest so they can get better! This website shows you exactly how to make this box. Whether your friend is sick in the hospital or sick at home with a nasty virus, everyone loves receiving soft blankets. 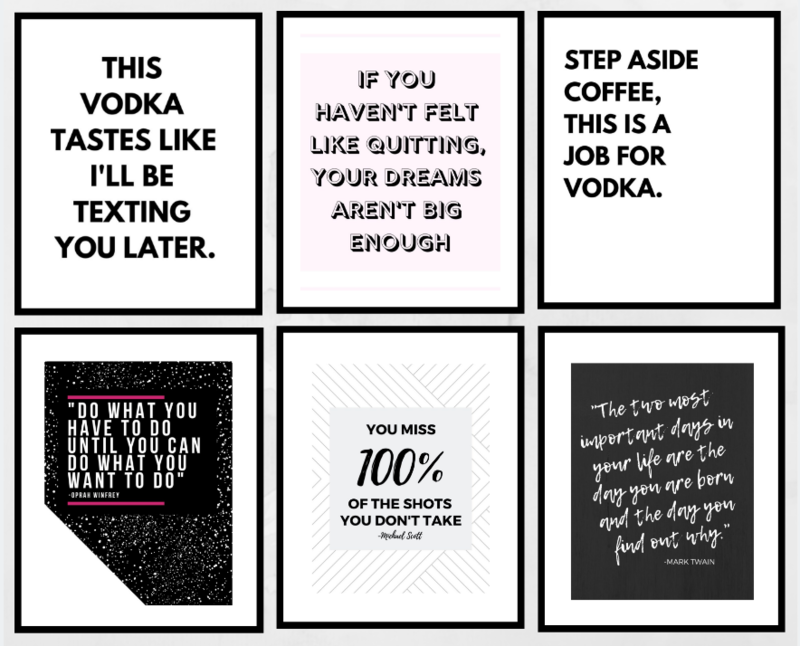 This blanket is full of positive words that will remind your friend that they will get past everything that they are going through! 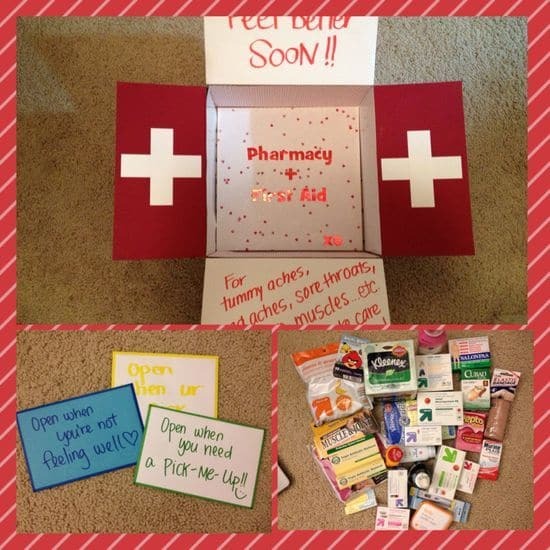 Here is another sick friend care package idea that brings the medicine to them. You're basically sending their mom in this care package with all the medicine you're including ;). A simple reminder to you're friend that whatever illness they are fighting, they can overcome it! This gift bag is the perfect thing to send a friend with a nasty cold or flu. Fill it with all the cold essentials like hand sanitizer, Ibuprofen, Throat drops, tissues, etc. Let's be real. Sometimes sickness just doesn't make sense. Why them? Why did they deserve this? These adult coloring books are a great way to add a little humor to a sick friend care package. It just might put a smile to their face for a few seconds. College students are stressed all the time and sometimes just need a little pick me up from their hometown friends or family. 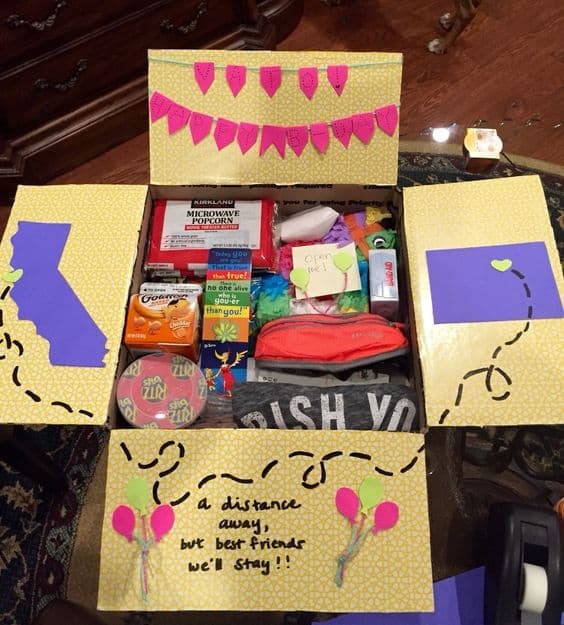 These friend care package ideas will totally surprise and help them see the cheerleaders they have even miles away. Send some sunshine towards the college students way with this box of all yellow themed products! Is there anything more a college student could want in a care package?! As a college student myself, I can tell you the answer is no ;). Best part is that it's in a friend's budget-- under $25 dollars for all of this! Pretty good. If you are in college/went to college, how many times per week do you remember saying you were going to drop out?! Sometimes college students just need a little motivation to hang in there and having it come from a friend is so sweet. 19. 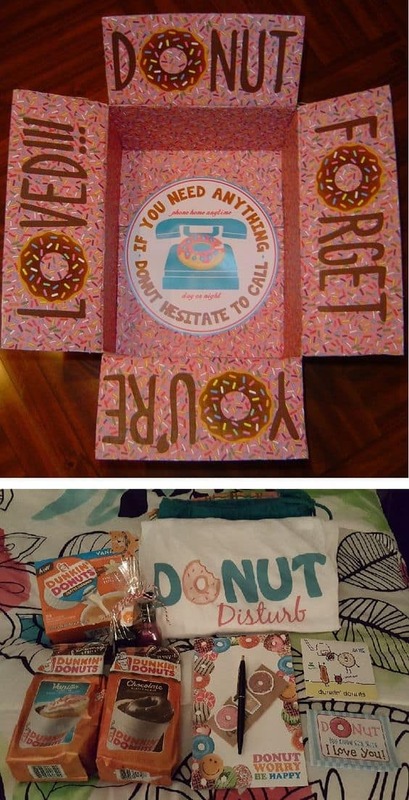 "Donut Forget To Call"
Such a cute friend care package idea! A cute reminder to them that you're only a phone call away! These are all meals that just require water to make! How clever is that?! This is the perfect care package for freshman because usually in a dorm you just have water and a microwave to survive off of ;). Do you randomly ever start thinking of a friend that lives far away and miss them? 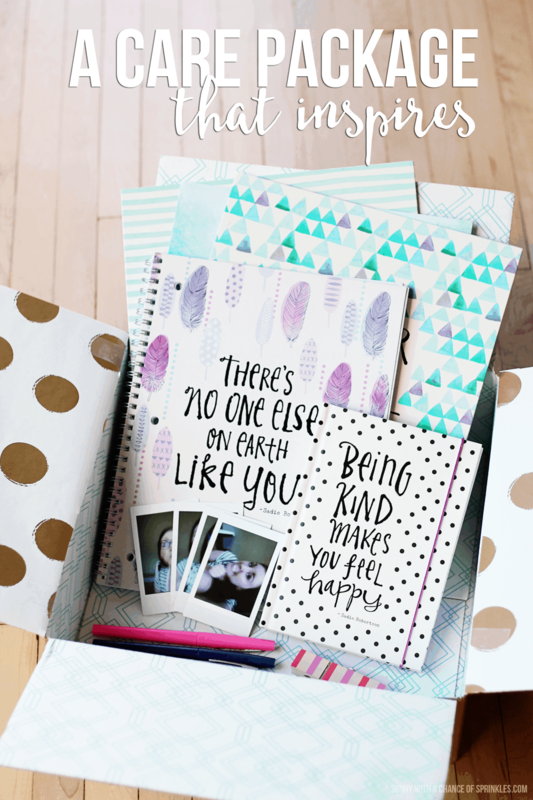 These just because care package ideas shows you different ways to let your friend know that you are thinking about them. Surprise your friend with this care package! Round up all the blue products you can find and you are good to go. 22. 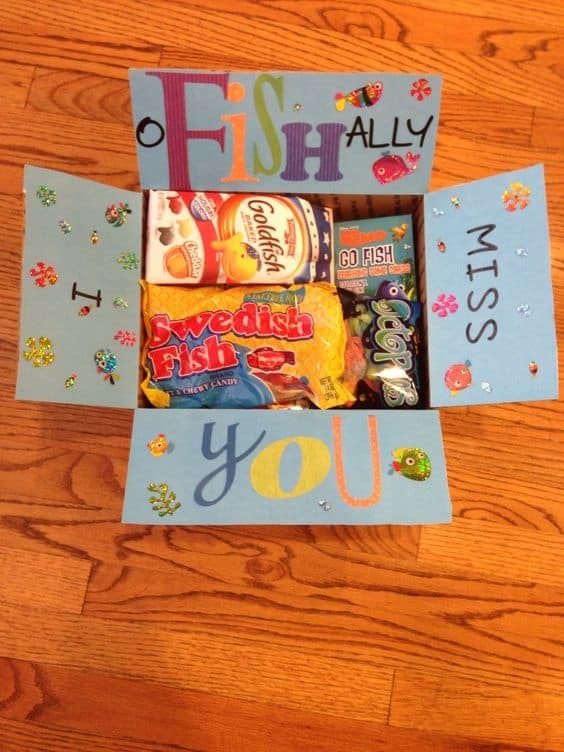 "I O-Fish-Ally Miss You"
Another themed friend care package idea.... I o-FISH-ally miss you! How cute?! 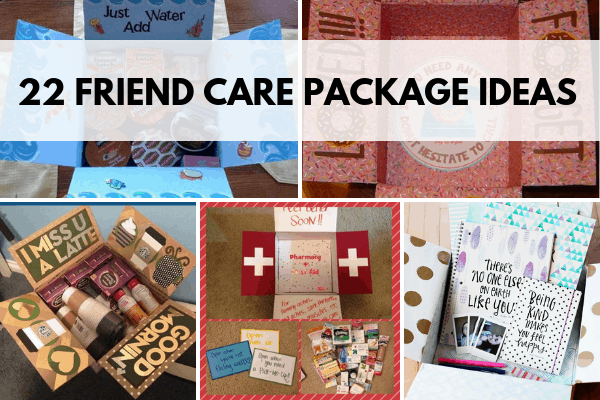 This post showed 22 friend care package ideas.